Mushrooms are a big part of Russian cuisine, they are plentiful in milder climates and many people are experienced mushroom pickers. 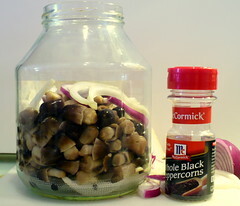 Mushrooms can be easily preserved by drying, marinating, canning or whatever else people do to store them and that makes them available year round. 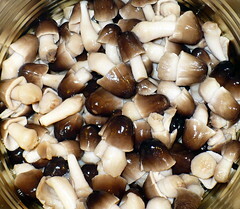 I like mushrooms in soups, fried, sauteed, marinated, in stews, in salads, etc. 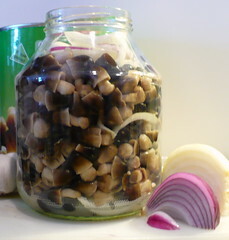 Like Pavlov’s dog I buy every jar of mushrooms I see in front of me, most of the time just to be disappointed because someone just decided to drown them in vinegar and make them inedible. Most of the local grocery stores sell regular white mushrooms or champignones. 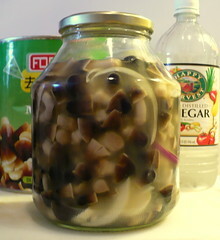 For a better variety of canned mushrooms you need to head to your local Asian store. There you’ll find a whole aisle filled with cans of exotic mushrooms. 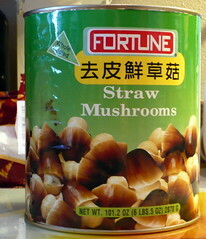 Yesterday I picked up a large can of straw mushrooms at the 888 Market in Overland Park. Straw mushrooms have a more rubbery, chewy texture, I usually like them peeled, although some sources say that they are better and more nutritious unpeeled. When buying and eating mushrooms you need to decide for yourself if you trust underpaid Chinese children to pick the right mushrooms for you. This blog will not be responsible for your untimely death from mushroom poisoning to which there is no antidote. This giant can cost me six dollars. The mushrooms are packed in slightly salted water which is pretty much tasteless. First thing to do after opening the can is to drain the water. After the water is drained the mushrooms look like this. For this recipe you will need onions, garlic, black peppercorns, bay leaf if you have it, salt, oil and vinegar. 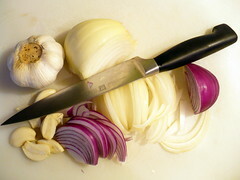 Slice the onions and peel the garlic, put as much as you feel like – you cannot over-onion this recipe. Then put your ingredients in the jar. You can do it in layers or not, especially if you are not taking pictures. In retrospect, a better idea would be to mix it up before putting it in the jar. Oh well. The marinade is not supposed to be over salted or too acidic. That’s why I am not giving any measurements, adjust it to your own taste by mixing salt, oil and vinegar. It should be slightly more vinegary than you’d like because the taste of vinegar weakens a little bit. Do not try to be Rachel Ray – olive oil solidifies in the fridge and I cannot guarantee the result with any specialty vinegar. Regular corn or vegetable oil and plain white vinegar will do just fine. You are done. 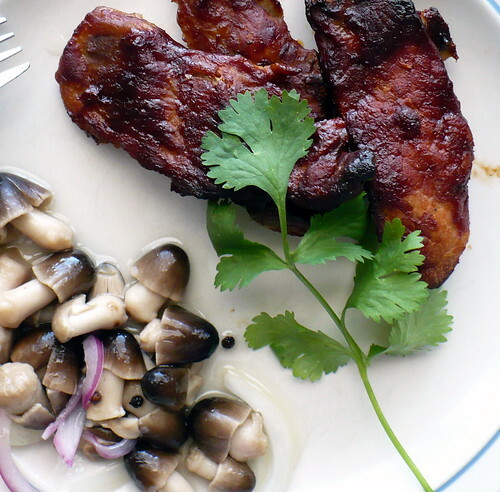 The marinade should cover the mushrooms. 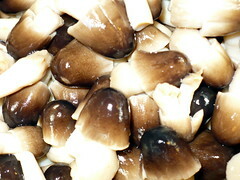 Do not hesitate to try the mushrooms and see if you like the taste. If not, add more of whatever is missing, usually salt or vinegar. 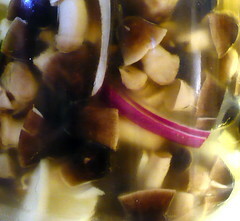 Leave in the refrigerator for few hours or overnight. Then add as a condiment to any dinner, for example, freshly cooked BBQ riblets. Add a cold glass of kvas and enjoy!